In the late 80s the blues were a new discovery for me, and I was devouring the music—but there were certain artists I avoided. At the time I was working at Jazz Record Mart, where I got to drink in the genre's entire history, and I distinctly remember picking up a bias against Albert King. I can't remember if it came from a coworker or not, but I know I was skeptical of him because he played a Gibson Flying V, and his fluency with the guitar's upper register seemed to me like a short hop from the self-indulgent blues-rock wanking that followed in his wake (he's been cited as an influence by Eric Clapton, Mark Knopfler, and Stevie Ray Vaughan, to name a few). That was enough for me to ignore King, even if it wasn't his fault. Luckily, I got over this foolishness. First I dug into his early-60s recordings for the King imprint, and eventually I picked up a copy of the classic Born Under a Bad Sign, his 1967 debut for Stax—the label where he enjoyed his greatest success, backed by the likes of Booker T. & the MGs and the Bar-Kays. That album includes blues staples like the title track, "Crosscut Saw," "The Hunter," and his first big hit, "Laundromat Blues." As much as I grew to love those albums, though, I didn't delve further. King's 1973 LP I'll Play the Blues for You was recently reissued, and once again I'm upbraiding myself for waiting till now to check it out. At the Green Mill in the aughts, I heard jazz pianist Jason Moran play a killer version of the title track during a trio gig, and it's been in my mind ever since to pick up the album—now I finally have. Odds are that if you've paid any attention to hip-hop over the past couple of decades, you've heard the horn-stoked opening groove of "I'll Play the Blues for You," which has been sampled on records by Prince Paul, Big Daddy Kane, EPMD, DMX, and Atmosphere, among others—you can check it out yourself below. King, a lefty who played a right-handed guitar upside down, was an expert at getting the biggest impact out of limited materials. His piercing, metallic solos occupy a relatively narrow range, but his complete mastery of bent notes and his distinctive sobbing articulation—coupled with an absolutely stinging tone—resulted in one of the most recognizable blues sounds ever. The songs he cut for Stax were often closer to soul and funk than standard blues forms, and the sensual, bittersweet groove, punchy horns, and enveloping organ on "I'll Play the Blues for You" make it one of the greatest examples of soul-blues. Considering how nasty his guitar playing could get, King was a surprisingly gentle, sophisticated singer—whether whispering spoken come-ons on the title track or delivering ominous threats of destruction on his superb cover of the Ann Peebles classic "Breaking Up Somebody's Home." (On the other hand, when he summons the spirit and sound of James Brown on "I'll Be Doggone," he's not especially convincing—and the nonchalant misogyny and violence of "Answer to the Laundromat Blues" is pretty hard to swallow.) The reissue adds an alternate version of the title track and one other song, in addition to two previously unissued tracks that are hardly throwaways. I wish I weren't so late to the party, but I'm glad I made it. 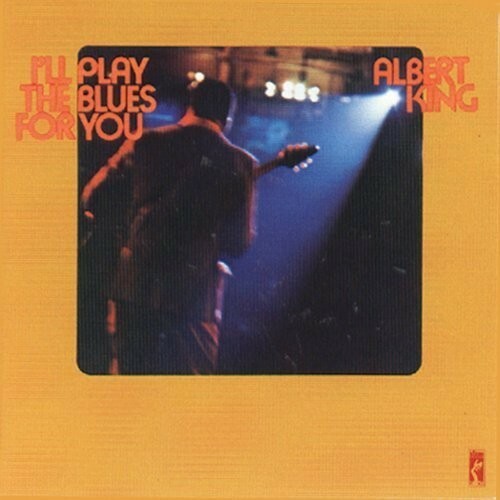 Albert King, "I'll Play the Blues For You"